This is a little different subject for the Sunday Stories. Some great history here, but sadly, much of our heritage is lost, or in danger of being lost. A friend recently posted a video of a Nebraska Heritage program dating back from 1962 of the historic Haumont Sod House in Custer County, Nebraska. A Google search doesn`t show any recent information about this amazing house. I fear that since 1962, when it was already in pretty dilapidated shape, it might have deteriorated into nothingness. Here is the video on Nebraska Studies. 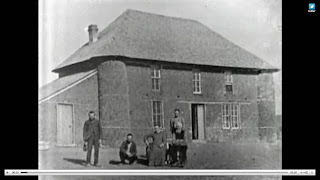 Here is also a link to the history of building a sod house. The rootsweb listing for Louis Haumont. It looks as if the sod house might have been added to the National Register of Historic Places, but little information is contained in the listing. 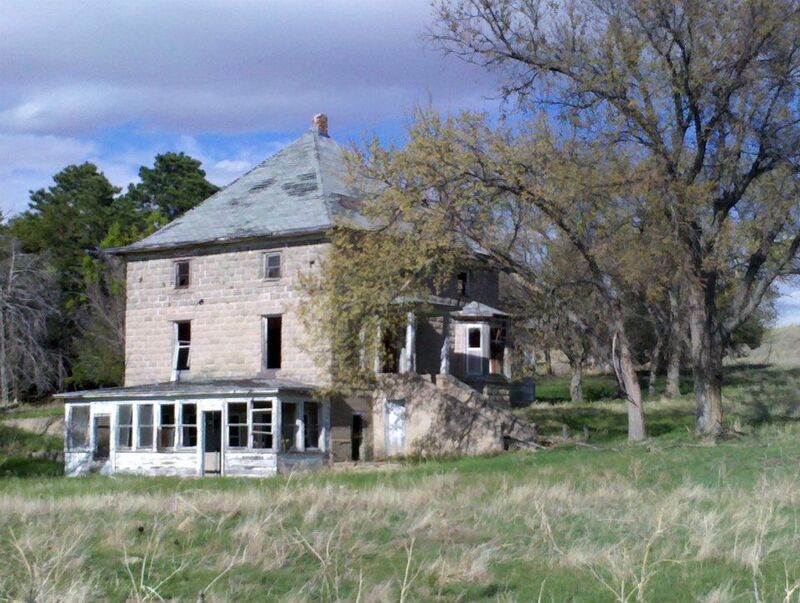 There is also a photo of the Haumont house in the Historic Buildings survey of Custer County. Is it gone now? Probably. Very sad loss of our heritage. 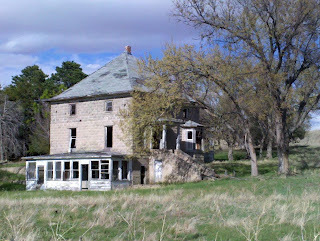 Below is a wonderful old home that can be found on private property north of Sutherland. It looks to be in much the same condition the sod house was in back in 1962. If I had a million dollars, I would go around restoring wonderful old homes like this. Would LOVE to take on that house! Pretty piece of property too (Great art center potential! Which of course is where my mind always goes first). Looks like they added the second story at a later date. Shorter windows, and a definite change in the color of the block. Wonder if the wooden addition was used for a greenhouse or canning . . . I've visited that house a couple of times and never noticed that before, but you're absolutely right. You can see the line where the block color changes. I haven't gotten up close, but I would almost bet it is made of homemade cinder blocks. It must have been quite a feat, first to build the house, then to add a second story. The Haumont Sod House has great memories for me. My father was a hired hand for the Haumont family in the 60's. I was born in 1963 and remember people stopping by to tour the historic house. Momma told us to stay away but my brother and I were so curious. Sometimes we got to show the house to visitors when no one else was around. Yes the house is gone. It was taken down due to deterioration and safety reasons. I don't recall when but probably the mid 70's. Thank you so much for your comment. I love when the stories I share spark a memory and the sharing of a little more information. Thank goodness you have memories of this historic home, the heritage of those settlement years lives on.